As the holiday season approaches, PHR will take a look at what teams are thankful for as the season heads past the one-quarter mark. There also might be a few things your team would like down the road. 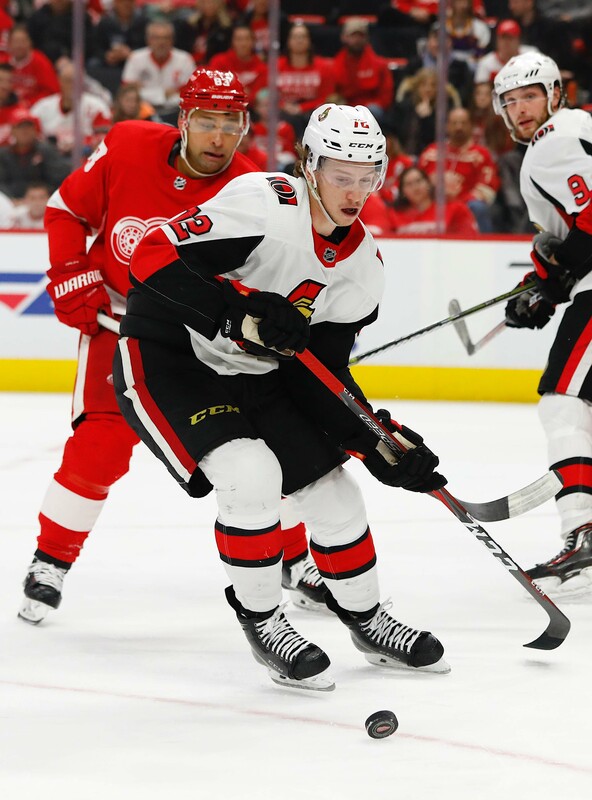 Let’s take a look at what’s gone well in the early going and what could improve as the season rolls on for the Ottawa Senators. Click here for the other articles in this series. What are the Senators most thankful for? Not being dead last. Most experts as well as fans had the Senators picked as the worst team in the league and with all the offseason turmoil coming from issues surrounding Erik Karlsson as well as locker room issues, the team was being viewed as a laughing stock. Throw in the fact that the team traded away their first-round pick to Colorado in the Matt Duchene trade and things were looking even worse. While the team isn’t in the playoff hunt, the Senators have been respectable on the ice and considering that they have opted to rebuild their team, 14-16-4 record, which could be a lot worse. Who are the Senators most thankful for? After almost an entire year of Erik Karlsson rumors, the team finally unloaded their superstar defenseman in a deal with San Jose. Many felt that loss would destroy the team, but second-year defenseman Thomas Chabot has been nothing, if not remarkable. The 21-year-old has already surpassed his offensive totals from last year when he posted 25 points in 63 games. This year, Chabot has already reached 35 points in 34 games and is tied for first in the NHL in points along with Toronto’s Morgan Rielly and Washington’s John Carlson. This development has made the transition away from Karlsson, who hasn’t taken off yet in San Jose, much easier for Ottawa fans as Chabot is starting to just scratch the surface to his skills in Ottawa. For a young team with very few veteran players, to have a defenseman averaging a point a game is a big deal. What would the Senators be even more thankful for? The team needs even more offense and while many of their young players have had some success already, the Senators are a team loaded in young talent. If the team could get some of those players to take that next step, the team would be far better off. The team have gotten some success from both Brady Tkuchuk and Colin White as both players have nine goals already. Surprise defenseman Max Lajoie is another rookie who has already posted six goals and 12 points. However, the team needs others to step up, including Drake Batherson who has seven points in 16 games so far. However, the team needs some of the top prospects in Belleville to take that next step at some point as well, including players like Rudolfs Balcers, Filip Chlapik and Logan Brown. What should be on the Senators Holiday Wish List? More than anything, the Senators need some clarity with some of their veteran players. The team has a number of pending unrestricted free agents in Duchene, Mark Stone and to a lesser extent Ryan Dzingel, and the last thing this franchise needs is for those players to walk away in free agency and leave the team with nothing. Unfortunately, no players have given a solid indication that they intend to return and if the team can’t come to terms on an extension with any of them before the trade deadline, they need to move them. Both Duchene and Stone have been impressive this year, so the team should get significant returns for those two if they are forced to trade them, but the team has to hope they can sign one of these players and begin to build this franchise up from there. Another firesale isn’t going to make the franchise look any better. The Washington Post’s Isabelle Khurshudyan may have gotten more than she bargained for when talking to Washington Capitals GM Brian MacLellan today. The Stanley Cup-winning executive let slip some internal team building plans, a rarity in the tight-lipped NHL. MacLellan acknowledged that the Capitals currently have a surplus of defensive prospects, but took it even further, stating that he hopes to trade some away in exchange for forward prospects. The first part of MacLellan’s statement is rather obvious and why Khurshudyan though to ask about his plans. The Capitals had struggled defensively for many years before putting together a solid unit en route to championship last season. Although it involved trading and later re-signing Brooks Orpik, the team was surprisingly able to keep the group together this year and moving forward, with seven of the nine defensemen who suited up in 2017-18 – most importantly the top six from the Cup run – returning. 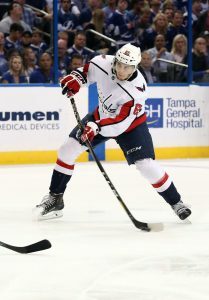 The top four of John Carlson, Michal Kempny, Matt Niskanen, and Dmitry Orlov are all signed through at least three more years, while Christian Djoos and Madison Bowey – both under 25 – are restricted free agents at the end of their current contracts. There isn’t much long-term opportunity for defensemen in the Capitals system, yet they are well-stocked in pro-caliber prospects. 2015 second-rounder Jonas Siegenthaler, 2016 first-rounder Lucas Johansen, and promising righty Connor Hobbs would all be pushing for NHL play time on a majority of teams across the league. The team also used first- and second-round picks on blue liners in June, selecting Alexander Alexeyev and Martin Fehervary respectively. 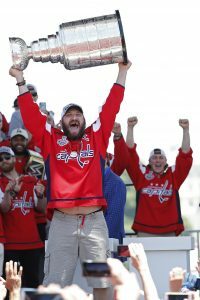 While it doesn’t hurt to have a redundancy of talent, it does seem as though the Capitals have too many mouths to feed on defense over the next five years or so. As such, MacLellan revealed that he would ideally trade some of those players for forward prospects of a similar caliber. Seeing as Johansen, Alexeyev, and Fehervary are recent high picks with room to grow, Siegenthaler and Hobbs would likely be the leading candidates to be dealt away, with an even an off-chance that one of Djoos or Bowey are dealt. Forwards of equal quality to that foursome would be far more valuable to Washington, who has ample opportunity up front moving forward but far fewer players to compete. Outside of Jakub Vrana, who Khurshudyan calls the Capitals’ “last high-end forward prospect”, and Andre Burakovsky, the depth of talent among young forwards in the system is not overwhelming. Many could have good careers as bottom-six forwards, including 2018 second- and third-round picks Kody Clark and Riley Sutter, but none seem to have much in the way of great top-six upside. The Capitals also don’t plan to be in a draft position next year to land a forward with elite scoring potential. So, they’re left to trade from an area of strength in the organization to fill an area of weakness. At least that is MacLellan’s plan. The fact that it is now public knowledge could help or hinder his attempts to make it happen.